17. "Kamikaze": tower relic from former amusement park, Eilat. 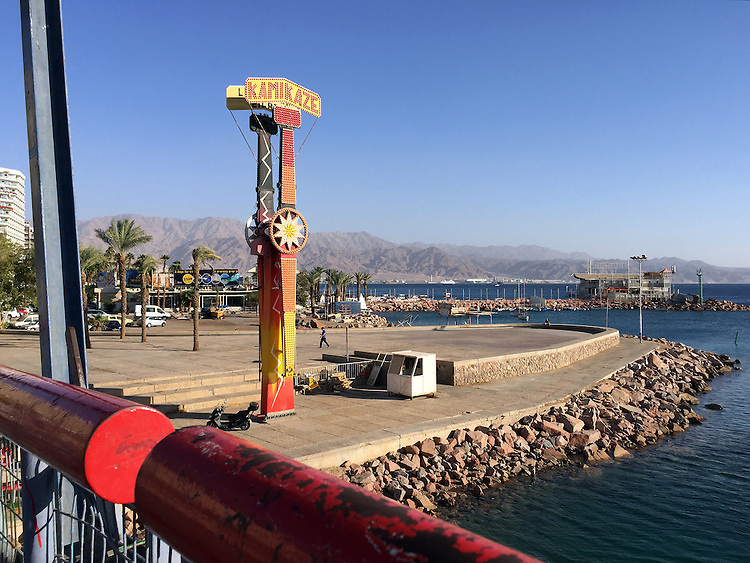 In the resort town of Eilat, this iconic structure labeled "Kamikaze" literally towers over the beautiful expanse of the mountains and Red Sea. I am on a bridge that affords me a panoramic view, but there is no indication of why this tower, apparently a relic from a former amusement park, remains. I feel like a cultural anthropologist who, after visiting ancient sites like Masada, is surprised to learn that in the modern world, "Kamikaze" can have a whole new meaning. Instead of Japanese fighter pilots who committed suicide for their cause during World War II, the "Kamikaze" became a hair-raising amusement ride, developed by the Italians after World War II. It's a pendulum device that swings two gondolas faster and faster, while passengers are bolted in with shoulder harnesses. It's a popular ride in Israel, as well as in the United States. But this ride in Eilat no longer functions. Now it's become a curiosity, albeit symbolic, in this seaside resort.